Unwinnable is a website and digital magazine, founded in 2010 to provide a different kind of cultural criticism. We love to read about different perspectives, so we set out to collect a diverse group of contributors, amateur and veteran alike, to tell their stories. From the silly to the serious, we pride ourselves on providing a friendly, thoughtful venue for writing that is free of the constraints of traditional internet publishing. Unwinnable remains 100% independent – it belongs only to its readers and writers. When we launched, we primarily covered videogames. The unwinnable state is one unique to many early adventure games – make the wrong decision and you can’t finish the game. Most of the time, the game wouldn’t even have the good grace to tell you that you messed up, leaving you to wander its world forever. And while being stuck in an unwinnable game sure can be frustrating, the idea that you can still explore is an appealing one to us that parallels some of our views on culture as a whole. Who needs endings? Real life never wraps up so neat and clean. It is a visual representation of one of our favorite unwinnable moments in a videogame. Early in King’s Quest V, King Graham has the opportunity to buy a pie from a bakery. He only has enough money for one pie and, unbeknownst to him, he needs the pie for a situation later in the game, so if he eats the fresh, delicious looking treat like a normal human being, the game becomes unwinnable. 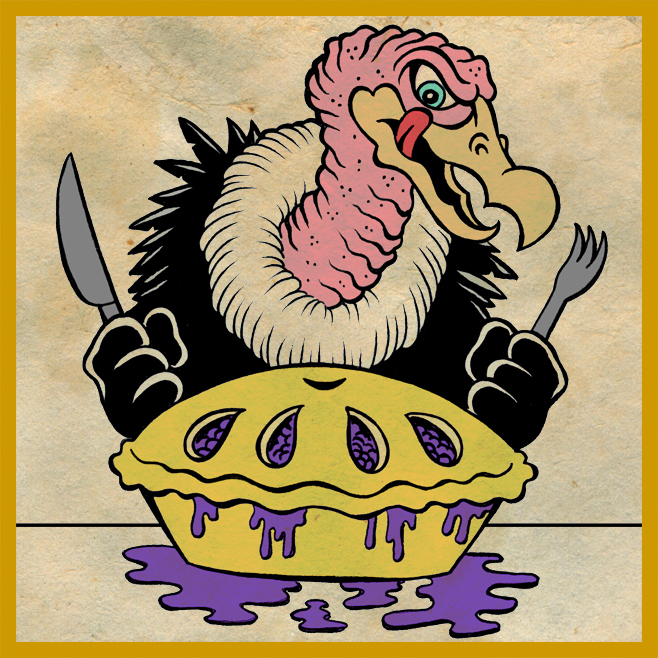 If King Graham wisely (and illogically) keeps the pie in his travel pack, he later comes across a vulture starving in the desert. Surely, this poor creature is the reason divine providence delivered that pie into Graham’s possession. Alas, no. If you feed the wretched vulture the pie, the game again becomes unwinnable. Why? Because later, King Graham encounters a fearsome yeti on a cliff in a high, snowy mountain and the only way to defeat the creature is to hit it in the face with the pie, knocking it over the edge to its doom. It is ridiculous and beautiful. Bonus: Vultures pick things apart, kind of the same way we do with the culture we love. This machine kills fascists. Eat the rich. Death to scumbags.